Happy Monday and April 25th! As a Rhode Islander, we celebrate April 25th as if it were Christmas or VJ Day (yeah, we still have that one on the calendar, too). The essentials: trench coat, rain boots, and umbrella. This waterproof bag is always with me on rainy days, too. The material is great and I love the zippered top. When there's not too much rain, how cute as these rain shoes? Gotta brighten up those rainy days with this scarf (how awesome are these Lilly state-inspired scarves?) and a bucket hat. Now for those of us who'd rather sit inside and watch the rain (and our rain chain): rain candle, a good book, a fresh mani (butler, please or sugar daddy), and a few rain drops only on your phone case. There you have it! The only thing I've found that I do not have in this list is some good waterproof makeup. I have my favorite mascara and setting spray, but if y'all have any other suggestions for water resistance makeup or other favorite rain attire, I'd love to hear about it! hunter boots for the win - especially for this florida girl! and i finally got a good trench after all these years. such a good investment! all great picks girl! Love that scarf and that hat. So cute! Happy April 25th! & yeah, you definitely two sets of rain boots... along with multiple umbrellas and rain jackets. There's always something rainy weather related in my car, especially during thunderstorm season. I love my longchamp! No other bag has worked so well for me! The other day Sophie put a water bottle opened in my purse and it sat like that for five hours before I realized that there was water just hanging out. Sure the stuff inside got wet, but the outside, there was no sign! When I was in Boston (after the snow) there was a day of crazy rain and I had everything, but my bag wasn't waterproof and I was so sad about it because it got soaked. I really need to get a pair of Hunter boots! Maybe this year I will finally do that. Such cute items! I always dread when it's raining and crazy how it can pop up so quickly down there! Can I just click "purchase" on this entire list?! I recently bought a new trench coat but I am really hoping for some new rain boots soon. Also a clear umbrella- perfect! Love all of your rain-prep items--so cute! We haven't had a TON of rain this April, but I'm definitely glad that the temps have been getting warmer! Today is shaping up to be a perfect day here in Chicago, so Miss Congeniality was correct :)! I definitely need to invest in some rain boots when I move to Houston especially with all their crazy flooding. Good idea about having a spare in the car! I'll also go ahead and take one of each of the other items you picked :)! I used to have a pair of rainboots then I sold them.. I never heard that about Charlestonians haha! It rains every day in the summer here so my hunters are always on standby. And I love music fests and they are great for the mud! The greatest day of the year! Happy April 25th! haha, June-Sept is pretty much how we live...rain will come pretty much everyday but not always very long, and of course always at 5pm! That gif is my favorite part from that movie. So freakin' hilarious. Love the boots! I LOVE your rainy day post! Life in the Low Country comes with a lot of rain and flooding. I love my Hunter rain boots! 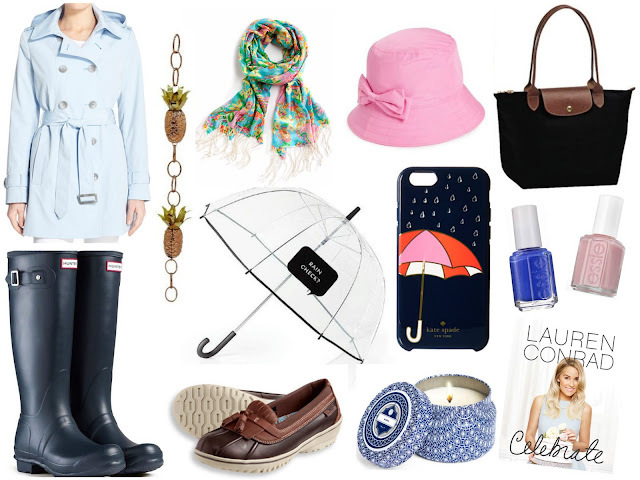 The Kate Spade umbrella is adorable too! It is poring here in NJ today. I wish I could say I wore some of these adorable clothes out to the grocery store but nope it was yoga pants and flip flops!